On Friday 12 January Fujitsu dismissed me under the guise of redundancy. They had given me the news by letter earlier in the week, when I was on compassionate leave for a family funeral. They didn't even allow me to work my notice despite the fact that I had an outstanding job application they hadn't responded to - for a job they had encouraged me to apply for. 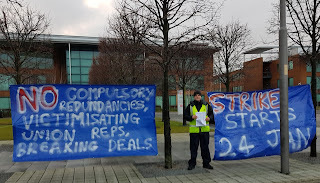 My redundancy was a fix to victimise me for my union activity - I was in a tiny fake selection pool where Fujitsu claimed all the jobs were to go, avoiding any scoring. I was the fourth member to be dismissed while fighting their redundancy, two more haven't yet been dismissed. Of the six, the majority are black or ethnic minority, the majority are disabled, two are union reps, and one was dismissed without Fujitsu hearing her grievance which included a complaint of sexual harassment linked to her selection. 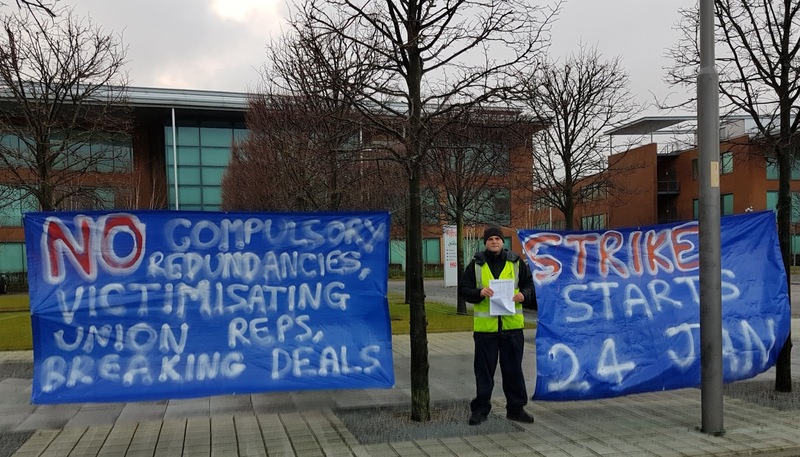 Fujitsu Manchester are on strike 24-26 January, 30 January and 8-14 February over compulsory redundancies, victimisation of reps and breaches of redundancy agreements. There's a particular push to get people to protest in support of the pickets on Wednesday 24th January. On Friday 26th January there will be a joint strike rally in Manchester city centre with the First Bus and Mears strikers. There's lots more information, including how you can support our campaign, on the Unite @ Fujitsu web site.